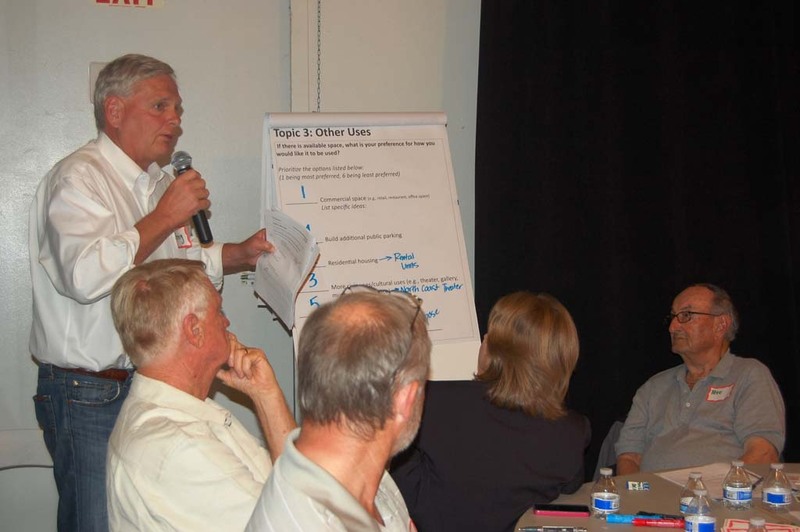 DEL MAR — Plans to replace the deteriorating, decades-old City Hall appear to be moving in the right direction, at least according to the approximately 40 people who attended a June 9 workshop. But when asked how the proposed facility could be improved, there was no shortage of recommendations. The conceptual complex includes a 9,250-square-foot City Hall with space for public counters, a lobby, conference rooms and indoor public restrooms, a luxury the existing facility lacks. The town hall would house the TV studio, community meeting rooms for up to 100 people, 51 parking spaces and a 15,000-square-foot plaza, room enough for the farmers market, which most residents say must be accommodated. Everyone seemed to agree the proposed facility, similar in size to the existing City Hall complex except for the town hall, would meet the community’s needs. But most said it should have flexible meeting rooms and cultural space, such as a multiuse theater. Other recommended ways to improve the complex included increasing the seating capacity of the town hall, adding a café or coffee shop and ensuring it is built to scale. There was also a suggestion to increase the size of the City Hall. When the topic turned to parking, there was nearly unanimous agreement that more is better. Nearly all said they were very interested, as opposed to somewhat or not at all, in adding public parking at the site to reduce parking impacts in residential areas, provide more overall public stalls and help downtown businesses. Most said they would support 75 to 175 stalls in addition to the required 51 for the City Hall complex, even at an estimated cost of $5.1 million to $7.5 million. “Anything to increase the public parking component is critical,” Bob Sonnhalter said. “We’ve got to get more public parking to induce people to come to this end of town,” Marty Peters added. More than half of the participants said additional parking on the site should be free. While there was a fair amount of consensus on the first two topics, opinions were all over the map when it came to other uses that should be considered for the site. Participants were given five fairly specific options and asked to rate them, with one being the most preferred. The most favored option was civic and cultural uses, such as a theater, gallery or museum. The least popular choice was open space or park use. “Open space is nice but it doesn’t bring in any revenue,” Howard Gad said, noting that the nearby Shores property has open space and parks. Housing was rated with a one, two twos, a three and two fours. Additional parking received two twos, a four and two fives. Commercial space garnered two ones, a two and three threes. The new complex is estimated to cost $10 million, not including any extra parking beyond the required 51 spaces. The city has the ability to finance between $13.5 million and $21 million. During a workshop in December, residents helped narrow down some of the choices, including where the new center should be located. There was consensus at that meeting and through a citizen survey that it should be built at 1050 Camino del Mar, the site of the existing City Hall. While some of the participants at the June 9 workshop attended the earlier one, most had not. City Manager Scott Huth said he was pleased with the turnout. “If any more people showed up we would need a bigger room,” he said. City officials have been studying and planning — and studying some more — ways to replace City Hall almost since the city bought the property in 1975. Council members are scheduled to review the results of the workshop and make some decisions about moving forward at the June 16 meeting.